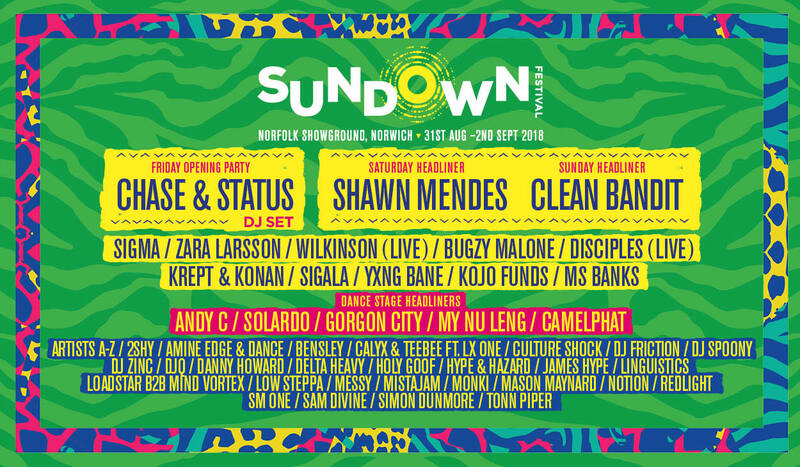 Sundown Festival has announced its 2018 lineup, which will see pop sensation Shawn Mendes top the bill alongside Clean Bandit. The pair's headline sets mark a distinctive move towards mainstream pop at the top of the festival billing. Last year's headliners were Craig David and Pendulum. However, there is plenty of urban and bass music further down, with the likes of Andy C, Wilkinson, My Nu Leng, Solardo, Gorgon City, Redlight, Bugzy Malone and Kojo Funds all appearing. Iconic drum and bass dup Chase & Status have been confirmed to play Friday night's opening party. Early bird tickets will be going on sale at 9am on Friday 23 February. Join our Waiting List here for first access to this sale. Sundown Festival will be taking place on 31 August - 2 September 2018. Find out more on our guide, and join our Waiting List here for first access to Friday's ticket sale. Melde dich für den Newsletter von Festicket an, um Angebote und Empfehlungen zu Festivals direkt in dein Postfach zu bekommen. Daneben halten wir dich mit Neuigkeiten zu Festivals und Artikeln aus dem Festicket-Magazin auf dem Laufenden.